No worries, I won't forget Pierre, 'le pilote'. I made my own pilots for my Bella Ballerina and the lightest one at 1:6 scale weighted 8g but was quite fragile. I will be making a new more realistic - less 'stiff' - one for Vicky as I will be able to use it for the Fury as well, being at the same scale. That is, if I ever get to the point of starting that latter build. I guestimate the 'new' one will be around 15 - 18g. 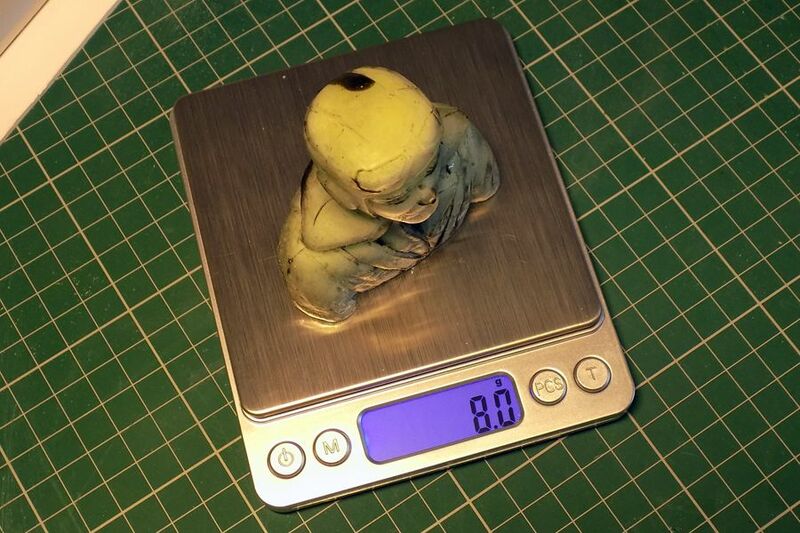 If any living soul is still interested in the figures, let’s have that second part of the weighing process. The stab/elevator parts are 35g. The fin and rudder 17g, the tail skid 7g, the Spanwis 10g and Pierre estimated at 20g at most. That brings our provisional weight to > 274 + 236 + 35 + 17 + 7 +10 + 20, being a total of 599g. Now the original Svenson plan clearly states a weight of 800g without R/C stuff. So I supposed it was the weight of the assembled parts included in the kit, which are outlined here above, exception made for the u/c wire. Why then that difference of +/- 200 grams? I’m certainly not complaining about it, but am I missing some point here, please… ? Only thing I can think of is the covering, it does add a little to the weight at the end, I'm allowing around 500g for my Dornier build this includes the brown paper glue and paint plus fibre glass to the hull, any less is a bonus. Thank you for commenting, Robert. I thought you could be right thinking about the weight of the covering, so I went to check the Svenson construction notes. Unfortunately the covering was 'optional' - they do mention Solartex and used it on their prototype - and isn't part of the vintage kit and the mentioned frame weight. Your idea made me think about the vintage wheels, but they're not included either as they advise to buy some vintage Veron or Williams Bros examples. Anyhow, it seems that I have a bit of a' weight bonus' that I will eagerly use for my planned detailing. However back to duty today and I do realize this isn’t ‘world news’ at all, but I finally decided to post it anyway. Even if it can only help one forumite, it will be worth the trouble of posting as it can be handy with all types of translucent covering. As you all know by now, Vicky is going to be covered with translucent Natural Solartex. As a few spots needed a bit of filler, like the epoxy glued elevator joiner, the simple use of lightweight ‘white’ filler would easily show up through the covering. I thought about using a ‘cousin’ of the famous ‘Freddie B sauce’ and decided to mix a small amount of filler with a few drops of Deluxe’s ‘Sand & Seal’ and half a drop of brown artist acrylic paint. 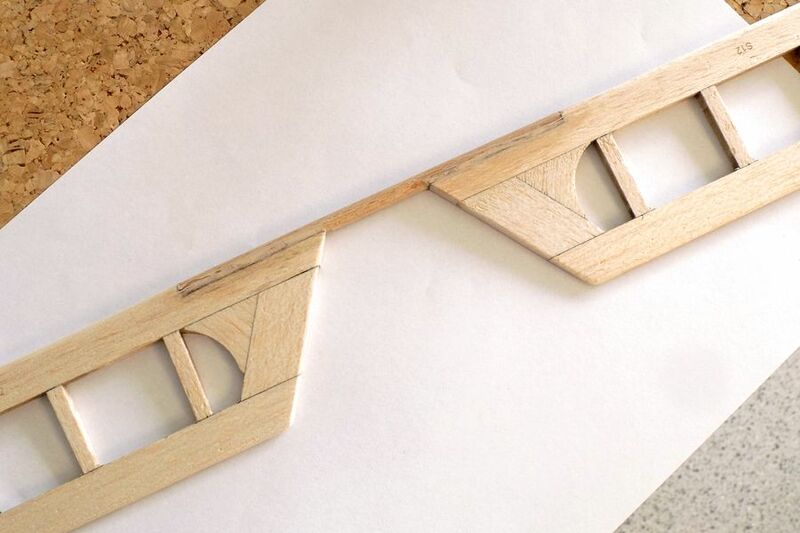 The mixture can then easily be brushed on in any desired thickness and is a pleasure to sand. 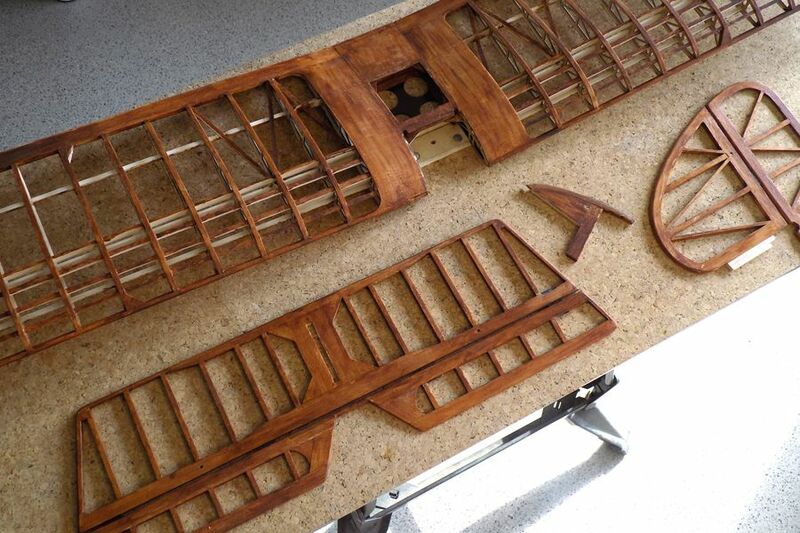 I was a tiny bit heavy-handed with the brown acryl as it is a bit too dark compared to the balsa, but Vicky’s parts will receive a darker staining anyway. Hi Chris just back from our hols in sunny Greece where it was unseasonably hot not much Internet where we were so have been catching up on things. Sound's as though the election work is going well hope you get the result for all of the work that you both have put in . As usual all of the work on Vicki is spot on, looking forward to the next installment. I'll forgive you leaving for holidays 'again'. The LotH and I really love Greece and Creta even more as the people over there really have a fantastic sense of hospitality. We normally go early June and - post summer - beginning October, but this year the latter had to be cancelled due to 'election duties' for Iris. She's really working hard and I try to assist her the best I can. Being 2nd in position on her party list, she has a big opportunity of being part of the Council. I managed to have a mini-session at La Grotte today and some pics will follow shortly. 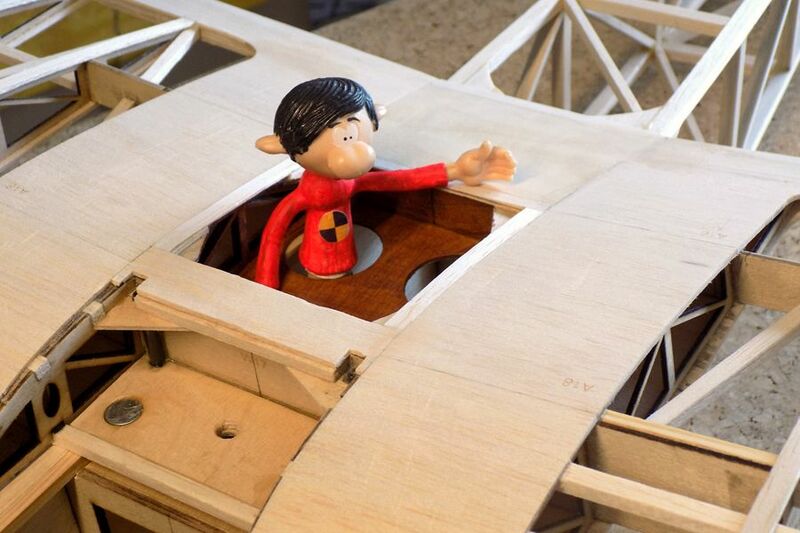 As the basic parts of the frame and control surfaces are now mainly built, Gaston insisted on having our first ‘bench flying’ session. First impression to me is that it appears quite ‘large’ at 1600mm wingspan or Gaston might just have been shrinking a bit.... ? As Gaston seems chuffed, I can only be pleased too. Looks amazing,no wonder Gaston is pleased I would be too with a model like that. Thank you both for the very motivating comments, gents. I managed to have a long and fertile afternoon in La Grotte today. 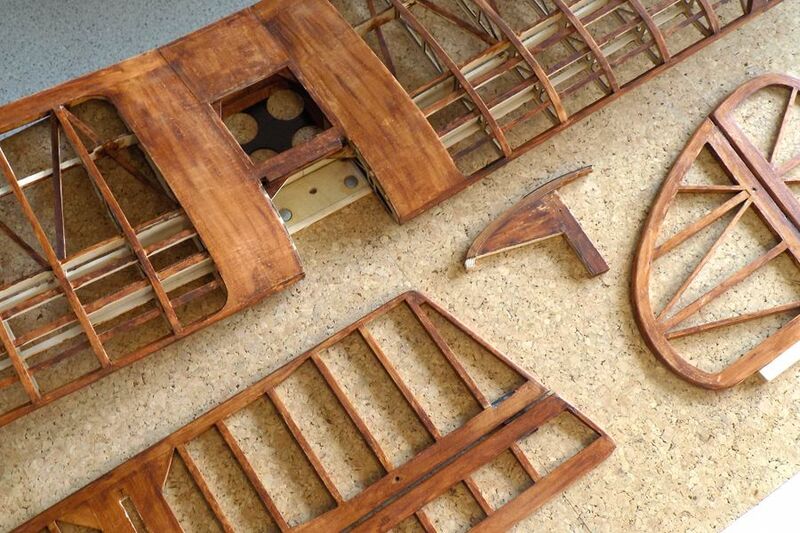 As the next step will involve staining of all those wooden parts, at least the bits in contact with the covering, I started with the first layer of tainted Sand 'n Seal to all of them. 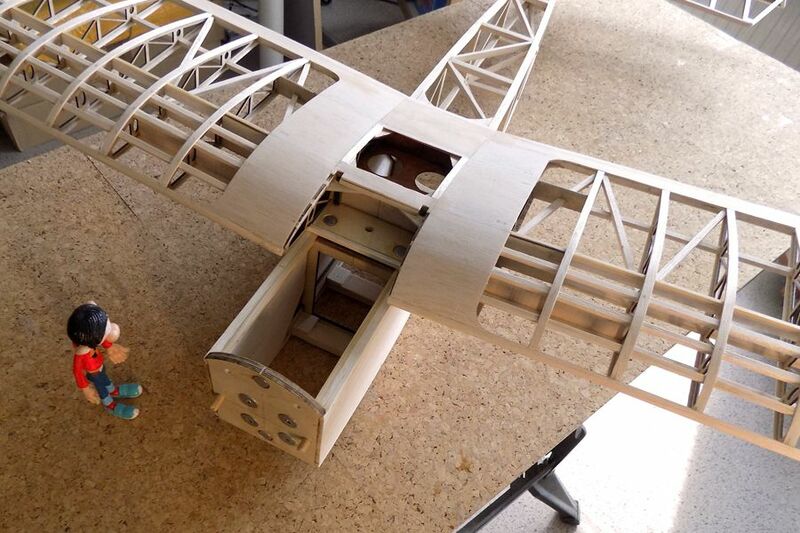 The stab/elevator got a final staining as well as the tail skid and the bottom side of the wing. Those parts are now drying and I hope to be able to finish the rest of it as well tomorrow. Pics to follow when it's 'safe enough'. 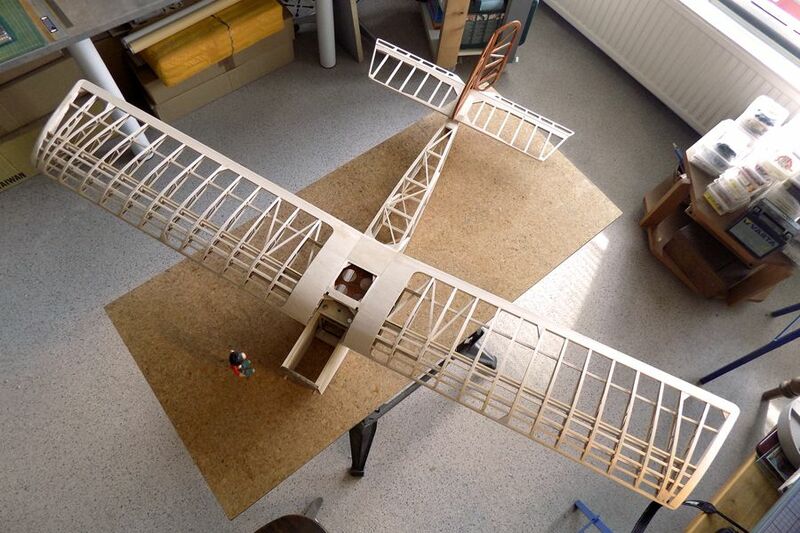 Hi Chris, very clean building job i must say !Some day i will build one like this , for some relaxed evening flights. Beautiful workmanship Chris, quite outstanding. When you see a model like that it almost seems a shame to cover it! Thanks for the kind and nice words, gents. 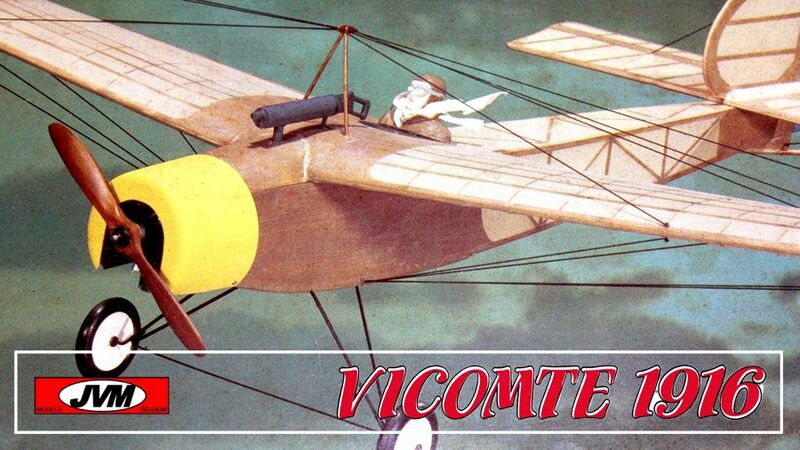 The Vicomte is supposed to be a great flyer, Dirk. If built light it can even be that slow that it's able to fly 'backwards' in a little breeze. Supposedly excellent for some calm and lazy evening flights. I share your thoughts regarding the covering, BEB. But I guess it won't fly that great without it. Back to La Grotte now for the next staining session. I’ve always liked to play with acrylics and particularly having them diluted to act like ‘aquarelle’ paint. Hence I thought Vicky’s wood staining would be quite enjoyable, but in the end, I’m glad having reached the end of it. Mind you, I really like the result, but it just took me a bit too long to remain totally therapeutic. I also painted the bottom of the cockpit in flat black to give it some more ‘depth’. I echo what's been said Chris, very good accurate work, I take my flat cap off to you, as would Drew. When I was reading about the "flat cap", I had a large smile and imagined Mr Pritchard making me an offer of £200 for Vicky. As I had time enough between the staining drying sessions, I had a small progress with some detailing bits. I have some 2mm thin and light ply of ‘unknown’ quality as it is the bottom of a French goat cheese from the ‘Vosges’ region. The two main advantages are that it has a thin vinyl lamination and… it’s free. 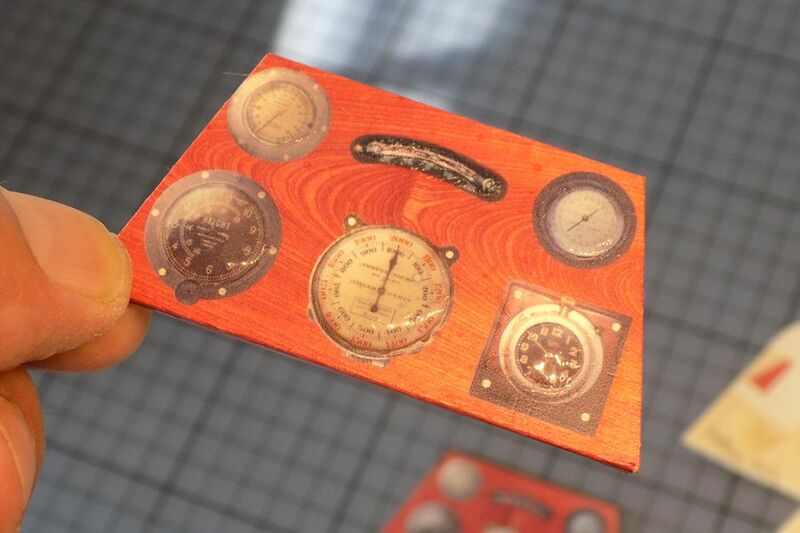 The lamination should help to assist the smooth adhesion of some water transfers, hence perfect to make Vicky’s instrument panel. As I had a duo of those decals - thanks for it, Gaston - I tested a solution that could give a more ‘glossy’ glass-type aspect to the gauges. 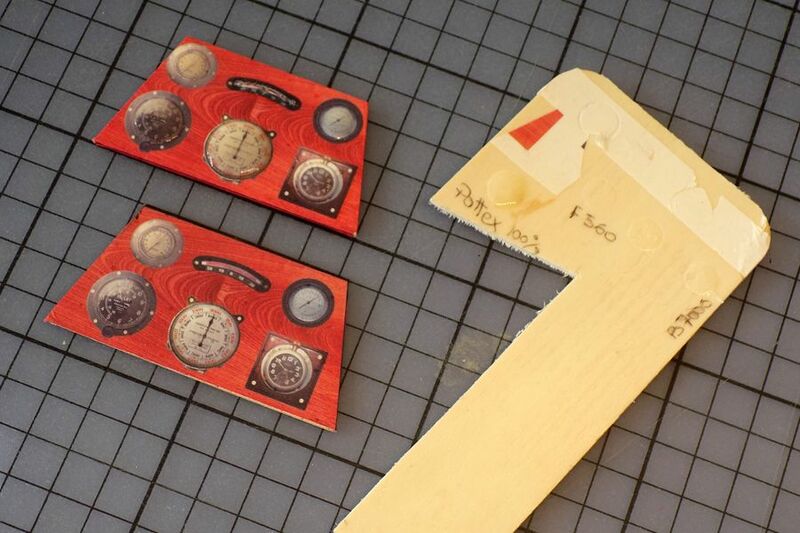 I tried to score the perimeter of the applied decals to be able to fill the gauge surface with a glossy ‘substance’ but I only managed to ruin the test decals. Scoring the transfer with the backpaper still on gave a much better result. I also tested different glues to be applied by capillarity, ie B7000 (jewellers glue) = too ‘gel-ish’, F560 (canopy glue) = nicely fluid, but too matt and finally, simple household Pattex 100% = a bit lacking of capillarity but very nicely glossy when dry. Unfortunately, the pic and the angle of the light don’t really show the top dashboard as being very different to the one underneath. This angle is a bit better but again only full daylight gives its gauges the true brightness. At least I can erase my doubts regarding the visibility of the Photoshop'd brass screws as they remain easily noticeable even at this small scale.